Can't continue this one. Struggled until page 79 (Chapter 4) and the characters got on my last nerve. The writing style isn't meshing with me, either. Too many lengthy descriptions and internal dialogue of the characters between actual dialogue. So much so that I can't remember what they were talking about when author returns to the conversation. A lot of repetitive internal dialogue, too. I think the author wanted to make sure readers understood the conflicts and over did it. Also, appears the characters have a backstory prior to this book. Not sure if it was in earlier books of this series as I have not read them. But this book starts off with the two main characters, Ann and Mike, already kissing (several times) with Ann pulling away, crying and not explaining why. Finally got to her internal "why" and I was rolling my eyes. I flipped through to see if it would pick up and saw that the style continues throughout the book. Can't do it. Others may enjoy this and I wish you all the best. I have too many other books I'm dieing to read to continue struggling with this one. Found this book in a thrift store due to its cover. The back summery hinted at a paranormal aspect to the story thus I bought the book. I loved the book. After I was done with it I wanted to know more and went to the authors site. It turned out it was part of a military series. So yes I had to backtrack. I usually avoid military romance stories but McKenna's writing completely hooked me. The overall storyline is fascinating. The relationships between the characters are very appealing and touched my heart. This series is a must read for military fans and anyone else who is interested. 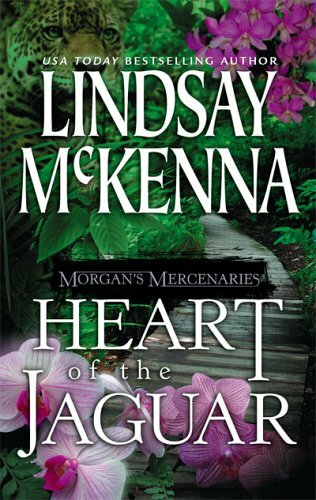 Morgan's Mercenaires: Heart of the JaguarMeeting Mike Houston one of Morgan's men and his love for Dr. Ann Parsons slowly developed and what they go through in Peru for it to come to be. When you've lost everything before, would you take another chance? I enjoyed this book, a battle of wills against ourselves taking chances. Yet some chances are worth taking, aren't they? you will enjoy this read, can't say much more or I'll ruin it for you. Had a hard time continuing this book near the end. Finally got though it. It is a good storyline but it had a hard time holding my attention. Lindsay McKenna - I've lived six lives in one and it all shows up in the books I write, one way or another.I was always a risk taker and broke mustangs at thirteen years old in Oregon. I learn to break them with love, not threat or pain. At 17 years old, I picked night-crawlers (worms) out in our Oregon orchards from 9pm to midnight, every night. I earned enough money to buy my school clothes and book. I also plunked down $600 to a flight company at the Medford, Oregon airport and asked them to teach mea girl fly. I soloed in 12 hours, which is average. From that time until I left for the US Navy at 18, I had accrued 39 hours of flight time in my Cessna 150 single engine airplane.I was in the US military and was an AG3 (weather forecaster). There was no airplane club, so I couldn't fly when I was in the Navy. But I could look at the clouds in the sky ;-).Later, I flew in a B-52 bomber for a day and night mission (18 hours total), a T-38 Talon jet, USAF, where I was riding in a "chase plane" on a test flight in a Dragonfly jet. I was one of the first AFLA (American Fencing League of America) women fencers to fence with epee and sabre. These weapons were closed to women because they were too 'heavy' for a female to handle. I said baloney and fought the males and won half my bouts. I was part of a surge of women fencers on the East Coast in the 1970's to push for equality in the sport. Together, we changed the sport and changed the mind of the men. Today? In the Olympics? Women now fence in foil, epee and sabre, thanks to what we did as a vanguard showing the world it could be done. I then became a volunteer firefighter when I was a civilian once more, the first woman in an all - male fire department in West Point, Ohio for three years. I became a local expert not only in firefighting, driving the engine and tanker trunks, but also had training in hazardous material (Reynoldsburg Fire Academy, Columbus, OH).My books always reflect what I experienced. If you like edgy, gritty, deeply and emotionally intense love stories with sympathetic heroes and heroines, check out my newest series that will be available mid-Oct. 2015, and it incorporates much of what I have lived.